With over 30 years of experience as both educator and performer, Kulu Sadira has combined his mastery as a musician with his skill, patience and clarity as a facilitator. His compassionate, “hands-on” facilitation approach creates an atmosphere of harmony and respect, combining humor with wisdom, and intellect with heart, serving business teams, leadership organizations, and conferences, as well as educational and community events worldwide. 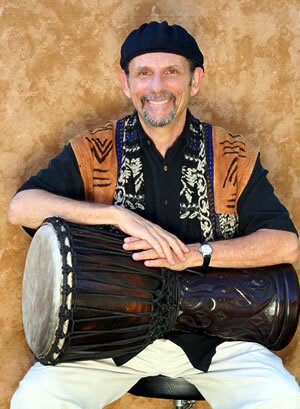 During his long career as a performing percussionist/vocalist (1972-1995), Kulu had the privilege to work with world-class entertainers such as John Denver, Jimmy Buffet, Kenney Loggins, B.B. King, Taj Mahal, Glenn Frey and Cher. He has studied with indigenous music masters Baba Olatunji, Mamady Keita, and many more. Kulu’s work has received attention in the Denver Post, TIME magazine and a variety of local and regional media outlets. Based in Fairfield, Iowa, with his wife Lori, he is in demand by diverse international groups including corporations, leadership training organizations, public and private service providers, personal empowerment programs, youth correctional facilities, universities, and a broad variety of association conferences, and corporate retreats.